In November 1943 American forces successfully invaded the Gilbert Islands, which the Japanese had wrested from British control shortly after the attack on Pearl Harbor almost two years earlier. Thus the United States initiated the great westward drive across the Central Pacific that would eventually bring Allied forces to the very doorstep of the Japanese homeland. This drive would constitute the northern or upper part of a two-pronged movement against the heart of Japanese military and economic power in the Pacific. The lower prong would be represented by General Douglas MacArthur's steady progress up the Solomon Islands, up the northern coast of New Guinea, and into the Philippine Islands. But it was to the Central Pacific route, westward from Hawaii through the myriad islands and atolls of Micronesia, that the American strategic planners had assigned the "main effort" in the war against Japan. Along this path U.S. naval, ground, and air forces under command of Admiral Chester W. Nimitz were to begin a series of amphibious assaults of size and scope unparalleled in the history of oceanic warfare. There was nothing new in the idea that the United States would have to seize strategic island bases in the Central Pacific in the event of a war against Japan. Throughout the 1920's and 1930's strategic planners in Washington had prepared a series of plans, designated the ORANGE plans, to provide for that contingency. All of these chose the Central Pacific as the main avenue of approach for a decisive move against the prospective enemy. The first ORANGE plan, approved by the Joint Army and Navy Board in 1924, conceived of an offensive war against Japan that would be essentially naval in character. By cutting the Japanese Empire's sea routes, and by air and naval operations, Japan, it was believed, could be isolated. The plan further provided that troops from the continental United States would be assigned to seize and hold islands in the Central Pacific, including the Marshall group, and that large bodies of troops would be dispatched to reinforce the Philippines. the final revision it was decided that the Philippines could be defended by their peacetime garrison plus whatever other local forces were available, without reinforcements from the United States. But none of the changes affected one basic aspect of the plan--U.S. naval forces would move westward through the islands of the Central Pacific to establish naval dominance in the western waters of that ocean. The ORANGE plans had been prepared on the assumption that only the United States and Japan would be at war. By 1941 this assumption was no longer valid. The emergence of the Rome-Berlin-Tokyo Axis, the American decision to support Great Britain in her struggle against Germany and Italy, and the growing realization that the United States was likely to become involved in war against the Axis caused American and British officials to prepare tentative plans for combined action. The last American plan made before 7 December 1941 was prepared on the assumption that the United States and Britain would be allied and at war with a combination of enemy powers and was designated RAINBOW 5. Although never formally approved by President Franklin D. Roosevelt, it was the plan put into effect at the outbreak of war between the United States and the Axis Powers. In the belief that Germany was the major enemy and would have to be defeated first, RAINBOW 5 declared the Atlantic-European theater to be the main area of operations. In the Pacific and the Far East the Allies would assume a role primarily defensive, although limited naval offensive measures were to be undertaken at the earliest possible moment. Specifically, the U.S. Army was to help defend the Hawaiian and the Philippine Islands, and to help hold the entrance to Manila Bay. The U.S. Navy's role in the Pacific was naturally more extensive. The Navy was to conduct raids, defend such American bases as Wake, Guam, Midway, and Samoa, "prepare to capture" the Japanese Mandated Islands and establish a fleet base at Truk, maintain the line of communications between the United States and the Philippines, and establish naval superiority in the western Pacific.1 Thus, with the assignment to the U.S. Navy of the task of seizing the Japanese Mandated Islands, including Truk, the role of the Central Pacific in the forthcoming war was reaffirmed. 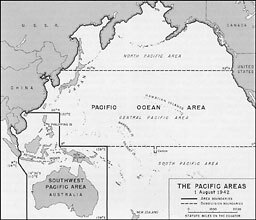 The Joint Chiefs on 30 March 1942, with the approval of President Roosevelt and the Allied governments concerned, had organized the Pacific theater into two great commands--the Southwest Pacific Area and the Pacific Ocean Areas. The Southwest Pacific Area, under General MacArthur, consisted principally of Australia, New Guinea, the Bismarck Archipelago, the Netherlands Indies, the Philippines, and adjacent waters. Areas, with headquarters at Pearl Harbor, was Admiral Nimitz, who concurrently served as Commander in Chief, U.S. Pacific Fleet. By the terms of his orders from the Joint Chiefs of Staff, Nimitz commanded virtually all Allied forces in his areas. He directly commanded the Central and North Pacific Areas, but according to his instructions he appointed a subordinate as Commander, South Pacific Area. After October 1942 this post was held by Admiral William F. Halsey, Jr. Missions assigned Nimitz and MacArthur were practically the same. They were to hold bases essential to the security of the U.S.--Australia line of communications, support operations that would contain the Japanese, support the defense of North America, protect necessary sea and air communications, and prepare for major amphibious offensives. German forces, the Allies would defend in the Pacific. But it had long been agreed that the Commonwealth of Australia and the Dominion of New Zealand, valuable as integral economic and political units of the British Commonwealth of Nations and as bases for future operations, would not be allowed to fall to the enemy. It was therefore necessary that the Allies hold the British Pacific possessions and retain control of the vital lines of communications to them. In early 1942 a substantial number of forces were sent from the United States to Australia and the bases along the line of communications. Defense of that line was also a primary mission of the U.S. Pacific Fleet. By February 1943 the armed forces of the two areas were still far from capturing Rabaul, but they had insured the safety of the line of communications between the United States and the British Pacific dominions. With the Japanese on the defensive, the supply lines fairly safe, and Allied air and surface strength on the increase, the Joint Chiefs of Staff could consider the possibility of further offensive operations in the Pacific, especially in the areas under Nimitz' immediate command. AMERICAN REPRESENTATIVES AT CASABLANCA CONFERENCE. Back row, standing, left to right: Mr. Harry L. Hopkins; Lt. Gen. Henry H. Arnold, Commanding General, Army Air Forces; Lt. Gen. Brehon B. Somervell, Commanding General, Services of Supply; Mr. W. Averell Harriman, Lend-Lease Coordinator in Great Britain. Front row, seated, left to right: General George C. Marshall, Chief of Staff, U.S. Army; President Franklin D. Roosevelt; Admiral Ernest J. King, Commander in Chief, U.S. Fleet, and Chief of Naval Operations. Pacific offensive to the Combined Chiefs in the afternoon of 14 January. He began his discussion with an analysis of the strategic situation in the Pacific, where, he declared, the Allies were engaging the enemy on four fronts: the Alaska-Aleutians area, the Hawaii-Midway line, the South and Southwest Pacific Areas, and the China-Burma-India theater. After pointing out that the object of the Guadalcanal and Papuan operations was to secure the approaches to northeast Australia, and that Rabaul was the key to the situation there, he brought forward the problem of where to go after Rabaul was captured by the Allies. 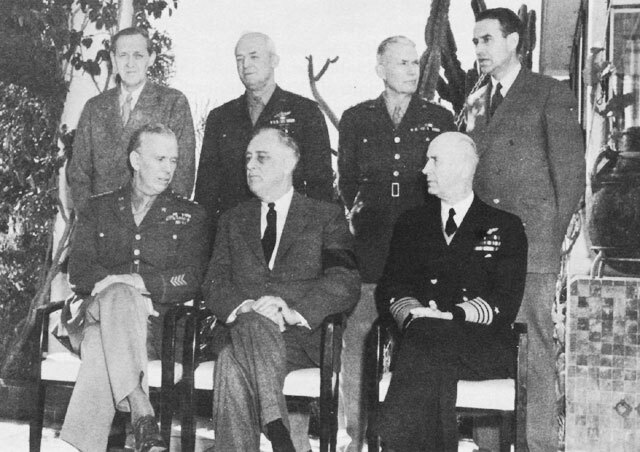 As far as Pacific strategy was concerned, the U.S. Joint Chiefs of Staff had accomplished much at Casablanca. They had expounded in some detail the significance of Pacific operations to their British colleagues, and had secured approval of at least a start on the drive across the Central Pacific in 1943. The possibility of beginning the advance was of course closely connected with MacArthur's and Halsey's operations against Rabaul. by February 1943 had completed a detailed, comprehensive plan known as ELKTON.14 In addition, he and his staff were considering ways and means to accomplish the ultimate defeat of Japan. Looking far into the future, they concluded that the recapture of Rabaul would gain "important, but not decisive advantages" that would help future operations but would not adversely affect Japan's war economy. In order to strike a great blow at the enemy's capacity to wage war, MacArthur and his planners reasoned, Japan should be cut off from the Netherlands Indies with its great quantities of oil, tin, and rubber. If the Allies seized the Philippines and developed air and naval bases there, Japan could be denied access to the Indies. Thus far MacArthur's conclusions agreed with those expressed by the U.S. Chiefs of Staff at Casablanca. But there was one major difference--the route of approach. Whereas the Joint Chiefs had clearly intimated that the Philippines were to be approached through the Central Pacific, MacArthur concluded that a drive through the Marshalls and Carolines would have to be made without land-based air support, would be slow, would cost heavily in naval power and shipping, and would "require a re-orientation of front." Since according to his reasoning the Central Pacific route was unwise, MacArthur desired that after he and Halsey had captured Rabaul, Southwest Pacific forces should advance west along the north coast of New Guinea and thence into Mindanao in the southern Philippines. Neutralization of the Palaus and seizure or neutralization of various islands in the Banda and Arafura Seas would protect the flanks of the advance.15 This long-range plan prepared by General MacArthur's headquarters was designated RENO. In March 1943 representatives of the Central, South, and Southwest Pacific Areas convened in Washington to meet with the Joint Chiefs and Joint Staff Planners in a series of sessions known as the Pacific Military Conference. This conference paid only slight attention to the Central Pacific; its primary purpose was to decide what should be the next immediate steps in the South and Southwest Pacific theaters. The Joint Chiefs of Staff were not at this time apprised of MacArthur's RENO plan, but they were given the full details of ELKTON. 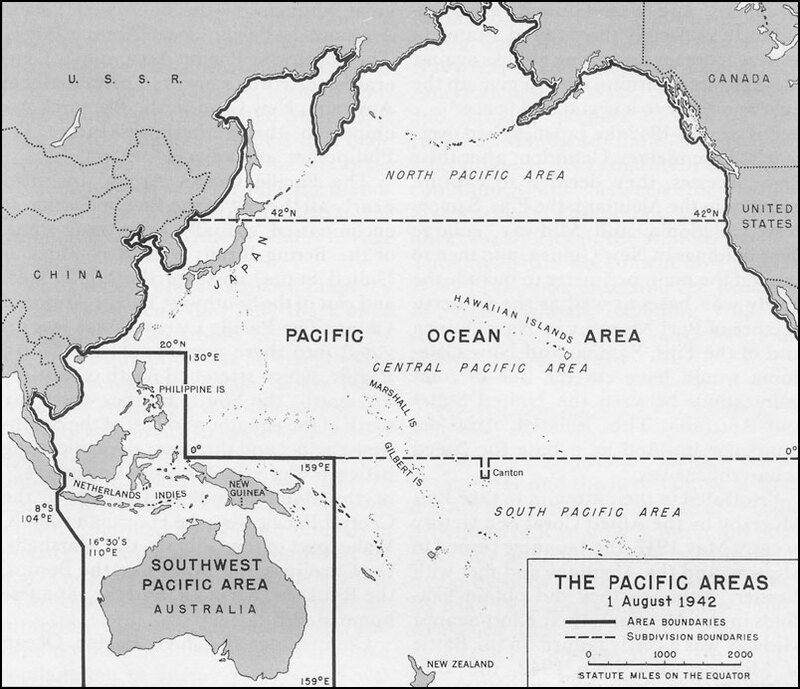 Thus, the Pacific Military Conference of March settled for the time being the immediate future in MacArthur's and Halsey's theaters of operation. By curtailing the list of objectives to be captured in 1943, the conference also indirectly gave impetus to the Central Pacific drive since any addition to the total shipping, manpower, and equipment that might be made available to the Pacific in the future would not have to be sent to bolster the capture of Rabaul. Instead, it could be assigned to Nimitz' Central Pacific theater. It remained for the Combined Chiefs of Staff to come to a final decision at their next meeting in respect to forthcoming operations in the Central Pacific and to determine which of the two theaters, MacArthur's or Nimitz', should be allocated priority in the drive against Japan. In May 1943 President Roosevelt and the Joint Chiefs of Staff met once more with Prime Minister Churchill and the British Chiefs of Staff, this time in Washington. The purpose of the Washington conference, which is generally known by its code name TRIDENT, was to re-examine Allied strategy for 1943 in the light of changes in the situation since the meeting at Casablanca. Little had developed in the Pacific since early February, and the conference concerned itself primarily with the European bomber offensive, the cross Channel attack, possible operations after the seizure of Sicily, and the Burma-China-India theater.17 But the conference was called upon to consider a tentative plan for the war in the Pacific drawn up after Casablanca by the highest American strategists. This plan, prepared by the U.S. Joint Chiefs of Staff and their subordinate committees 18 and submitted to the Washington conference on 20 May 1943, was entitled "The Strategic Plan for the Defeat of Japan. "19 "Strategic Plan" was actually a misnomer. It was not a plan according to strict military definition, for it gave no estimates of enemy strength and dispositions, did not mention the types and numbers of Allied forces that would be required to accomplish the missions it described, said nothing about command or commanders, and did not establish time schedules. Nevertheless, although more of a set of ideas than a plan, the "Strategic Plan" became the cornerstone of Pacific strategy for the remainder of 1943 and for 1944. Furthermore, it diverged widely from MacArthur's strategic concepts as expressed in RENO. of the British Commonwealth of Nations, although these were not mentioned by name. The ultimate objective of all operations was naturally the unconditional surrender of Japan. It was then thought that securing unconditional surrender might require an Allied invasion of the Japanese home islands, although the U.S. Chiefs of Staff and their subordinates agreed that control of the sea, especially of the western Pacific, might bring about unconditional surrender without invasion, and even without an air offensive. If invasion proved necessary, it could not be successful unless the Japanese will to resist had been seriously weakened. Undermining the enemy's powers of resistance and his desire to keep fighting by a large, sustained air offensive against the home islands was regarded as the best method. The possibility of employing air bases in the Kuril Islands, Formosa, and Siberia to mount the offensive was discussed, but it was agreed that China offered the best sites.20 China would thus have to be maintained, and United States and British forces would need to fight their way to China in order to secure a good port, preferably Hong Kong. The next problem dealt with by the plan was that of the selection of the route and methods by which U.S. forces would approach Hong Kong from the east. Here was one of the basic strategic decisions of the Pacific war. United States forces, it was decided, were to advance westward from Pearl Harbor through the Central Pacific, and through the South and Southwest Pacific Areas to open a line of communications to the Celebes Sea, recapture the Philippine Islands, secure control of the northern part of the South China Sea, and join in the descent upon Hong Kong. vulnerable flank and isolate Japan from her overseas empire. Furthermore, if Allied fleets destroyed or contained the enemy fleet, they could then strike directly from the Pacific against the Japanese home islands, without relying exclusively on aerial bombardment from fields in China. The Japanese could deploy only limited air and ground forces in the islands and atolls of the Central Pacific, whereas on the southern route only the availability of troops, planes, and ships would limit the size of the Japanese forces. The Allies, on the other hand, were under no such handicap because of their superiority in carrier-based air power. In the absence of land-based aircraft, carrier-based planes could support amphibious operations against island fortresses. A successful drive through the Central Pacific would outflank the Japanese in New Guinea, whereas operations along the northern New Guinea coast would neither eject them from nor outflank them in the Central Pacific, and the Japanese would retain relative freedom of naval maneuver. And, as Admiral King had pointed out at Casablanca, an Allied drive exclusively along the southern route would expose flanks and rear to enemy attacks. Whereas an attack through New Guinea into the Philippines or the Indies would be a head-on push against large islands containing positions closely arranged in depth, one directed through the Central Pacific would strike at vulnerable positions separated from one another by vast ocean reaches, and thus not quite so well placed to support one another. Seizure of the Marshalls and Carolines would give the Allies control of much of the Pacific and place them in position to isolate Japan from the Philippines-Indies salient, perhaps by the seizure of Formosa. Further, the great American naval shipbuilding program would be largely wasted if the southern route were used, and certainly the U.S. Pacific Fleet could best be used in long-range offensives. But if all these factors favored the Central Pacific as the area where the "main effort" against Japan should be launched, other considerations argued for continuing the South-Southwest drive at least as a secondary effort in support of the principal offensive. In the first place, it was believed that Australia would doubtless object to a redirection of all offensive effort to the Central Pacific. Besides, the oil fields of the Vogelkop Peninsula of New Guinea, then in Japanese hands, might be of some use to the Allies. Furthermore, Allied forces in the South and Southwest Pacific Areas were already in close contact with the Japanese, and shifting them all to the Central Pacific would waste time and shipping. Finally, and most important, was the fact that twin drives along the central and southern axes would provide more opportunities for mutual support, and by preventing the Japanese from being able to guess the time and place of forthcoming advances would keep them strategically off balance. For these reasons, then, American strategic planners decided to make the twin drives, with the main effort through the Central Pacific. Two days later the Combined Chiefs of Staff approved a lengthy paper containing the U.S. Joint Chiefs' proposals for Allied objectives in the Pacific and Far East in 1943 and 1944. This paper, based on the "Strategic Plan," repeated previous arguments and provided estimates of forces required and forces actually available for particular operations. It was estimated that capture of the Bismarck Archipelago, which would secure the line of communications to Australia and help provide access to the Celebes Sea, would require perhaps seven divisions of which five would be amphibious units. If Rabaul were effectively neutralized by air bombardment, perhaps only five--three amphibious--would be needed. Assuming that Allied forces could capture western New Britain and southern Bougainville by December 1943, the Joint Chiefs concluded that the Bismarck Archipelago operations would not be completed before April 1944. 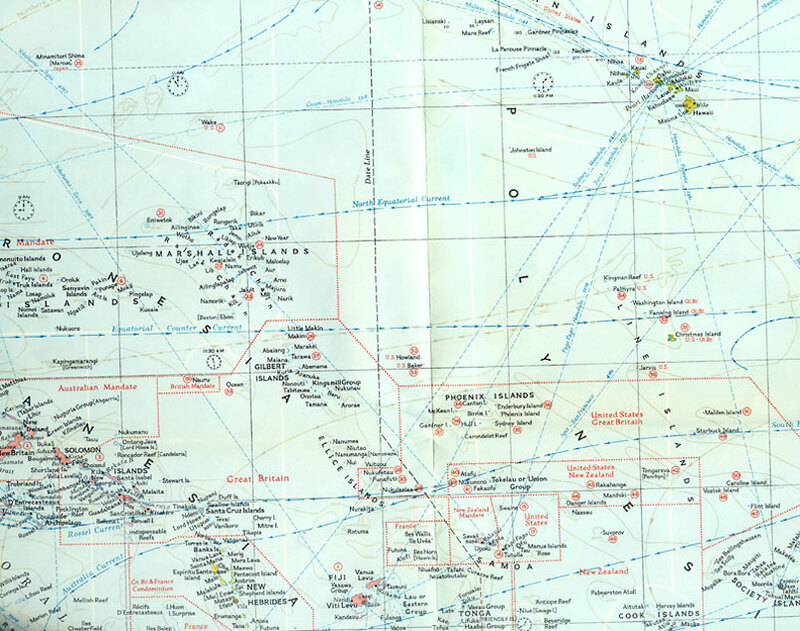 Seizure of the Marshalls, it was agreed, was essential to an extension of the line of communications to the Celebes Sea, and would also shorten and secure the routes to Australia. From the Marshalls, land-based aircraft could help support naval surface operations against the enemy's communication lines, and there was always the possibility that an Allied push into the Marshalls would force the Japanese fleet to come out fighting. The Marshalls operation would require two reinforced amphibious divisions, four heavy bombardment and two fighter groups of land-based planes, and aircraft from four standard and four auxiliary aircraft carriers, in addition to four battleships, three more auxiliary carriers, twelve cruisers, sixty-three destroyers, twenty-four attack transports, forty-four tank landing ships (LST's), plus landing craft. Garrison forces would include one reinforced division, 10 defense battalions, 545 planes, and 18 motor torpedo boats. The entire operation, from the initial invasion to the time the assault troops were withdrawn and readied for the invasion of the Carolines, would last six and three-fourths months. and put them in position to push on to the southwest or to threaten the Japanese archipelago directly. Truk and Ponape, as well as various other atolls, would have to be captured; air raids against Guam and Saipan in the Marianas would be necessary. It was agreed that the Carolines should be approached through the Marshalls even if Rabaul were in Allied hands. No specific time limit was set, but the Combined Chiefs of Staff agreed that the proposed Carolines campaign would be lengthy. And it would require, they estimated, 3 reinforced amphibious divisions, 2 heavy bomber groups, 10 carriers of the Enterprise and Essex classes, 7 auxiliary carriers, 4 modern battleships, 9 old battleships, 31 cruisers, 108 destroyers, 20 submarines, 45 attack transports, 15 attack cargo ships, 6 LSD's (landing ships, dock), 3 headquarters ships (AGC's), and miscellaneous auxiliaries. To garrison the islands would take two reinforced divisions and three defense battalions, plus aircraft. Controlling factors would include amphibious equipment and availability of divisions with amphibious training. There were then two Marine divisions (the 1st and 2d, in the Southwest and South Pacific Areas, respectively) that were ready to go, with the 3d Marine Division in the South Pacific supposed to be ready for combat by 15 July. The 4th Marine Division in California was expected to complete its training before the end of the year. Since transferring divisions from the South and Southwest Pacific to the Central Pacific would take many ships that were urgently needed elsewhere, it was agreed that two more Marine divisions and two more Army amphibious divisions were required in the Pacific. The final resolutions of the conference, as approved by President Roosevelt and Prime Minister Churchill, established the Allied objectives for the remainder of 1943 and part of 1944, and allotted certain forces for reaching those objectives. All decisions reached at Casablanca that did not square with the Washington resolutions were canceled. The Americans and British restated their determination to force the unconditional surrender of the Axis at the earliest possible date. They decided to "maintain and extend unremitting pressure" on Japan to reduce her war-making power and to gain new bases with the expectation that Britain, the United States, and all Allied Pacific powers (including the Soviet Union if possible) would direct all their resources to force the surrender of Japan soon after Germany's defeat. The program for the Pacific and Far East was ambitious and complicated. Using as a basis the U.S. "Strategic Plan for the Defeat of Japan," the Combined Staff Planners were to prepare an "appreciation leading to a plan for the defeat of Japan," including an estimate of the necessary forces. Recapture of Burma in 1943 was considered impossible, but preliminary operations were to be started, air operations intensified, and the flow of supplies to China augmented. the Japanese from the Aleutians,25 seizure of the Marshalls and Carolines, seizure of the Solomons, Bismarck Archipelago, and Japanese-held New Guinea, and intensification of operations against the Japanese lines of communication--were all accepted. Thus the Washington conference of May 1943, although not primarily concerned with Pacific strategy, made important decisions regarding the conduct of the Pacific war. By approving in a general way the "Strategic Plan for the Defeat of Japan," it set the pattern of strategy for the duration of the war against Japan. By authorizing the drive through the Marshalls and Carolines and approving allocation of the required forces, it determined the course of Admiral Nimitz' operations for about a year. With the selection of the classic Central Pacific route, the Joint Chiefs now faced the tasks of deciding on exact objectives and of picking the precise units for the forthcoming drive across the Pacific. 1. Information on ORANGE and RAINBOW plans is derived from Louis Morton, The Fall of the Philippines, UNITED STATES ARMY IN WORLD WAR II (Washington, 1953), Ch. IV. 3. For a detailed discussion of Japanese strategy, strength, and dispositions see below, Ch. IV. 4. The directive establishing the command used "Area." Memo, JCS for President, 30 Mar 42, incl Directive to CINCPOA and Directive to Supreme Commander, SWPA, ABC 323.31 POA (1-29 42), I-B. Usage has authorized the plural, however. 5. By the 30 March directive a third command, the Southeastern Pacific Area, was set up but never became a theater of operations and so lapsed into insignificance. Directly under Admiral Ernest J. King rather than Admiral Nimitz, its western limit ran from Antarctica northward along the meridian of 100° west to latitude 11° north and thence east to the coast of Central America. On 2 July 1942 the boundary between the South and Southwest Pacific Areas was moved from 160° to 159° east longitude in order to place Guadalcanal and adjacent islands in the South Pacific Area. (Joint Directive for Offensive Opns in SWPA Agreed on by U.S. Chiefs of Staff, 2 Jul 42, OPD 381, Sec. II, Case 83). 6. See John Miller, Jr., Guadalcanal: The First Offensive, UNITED STATES ARMY IN WORLD WAR II (Washington, 1949); Samuel Milner, Victory in Papua, UNITED STATES ARMY IN WORLD WAR II (Washington, 1955); Samuel Eliot Morison, HISTORY OF UNITED STATES NAVAL OPERATIONS IN WORLD WAR II, Vol. IV, Coral Sea, Midway, and Submarine Actions (Boston: Little, Brown and Company, 1949), and Vol. V, The Struggle for Guadalcanal (Boston: Little, Brown and Company, 1949); Maj. John L. Zimmerman, USMCR, The Guadalcanal Campaign (Washington, 1949); Wesley Frank Craven and James Lea Cate, eds., THE ARMY AIR FORCES IN WORLD WAR II, Vol. IV, The Pacific: Guadalcanal to Saipan, August 1942 to July 1944 (hereafter cited as AAF IV ) (Chicago: University of Chicago Press, 1950). 7. The Joint Chiefs of Staff together with the British Chiefs of Staff, or their representatives in Washington, constituted the Combined Chiefs of Staff (CCS). 8. For a more complete discussion see John Miller, Jr., "The Casablanca Conference and Pacific Strategy," Military Affairs, XIII (1949), 209-15. 9. CCS 135, 26 Dec 42, title: Basic Strategic Concept for 1943; CCS 135/1, 2 Jan 43, title: Basic Strategic Concept for 1943--The European Theater. 10. Min, 56th mtg CCS, 14 Jan 43. Proceedings and papers of the Casablanca Conference are filed in sequence with the CCS and JCS minutes and papers. They were also printed and bound, along with the proceedings of the meetings between the President and Prime Minister, in a volume entitled Casablanca Conference: Papers and Minutes of Meetings (edited and printed by the CCS, 1943, and filed in the office of the G-3. See also Robert E. Sherwood, Roosevelt and Hopkins: An Intimate History (New York: Harper & Brothers, 1948), Ch. XXVII, for an analysis of the conference from Harry Hopkins' point of view. The discussion of strategy at the Casablanca Conference will be more fully treated in Maurice Matloff, Strategic Planning for Coalition Warfare: 1943-1944, a volume now in preparation for this series. 11. CCS 153 (Revised), 17 Jan 43, title: Situation to be Created in the Eastern Theater (Pacific and Burma) in 1943. 12. Min, 60th mtg CCS, 18 Jan 43. 13. Proceedings of the last meeting, Casablanca Conf, pp. 154-69; CCS 155/1, 19 Jan 43, title: Conduct of the War in 1943; CCS 168, 22 Jan 43, title: Conduct of the War in the Pacific Theater in 1943; CCS 170/2, 23 Jan 43, title: Final Report to the President and Prime Minister Summarizing Decisions by the CCS. 14. GHQ SWPA, ELKTON Plan for the Seizure and Occupation of the New Britain-New Ireland-New Guinea Area, 12 and 28 Feb 43 versions. A copy of the 12 February ELKTON is in OCMH files; a copy of the 28 February version is in G-3 files. For a more detailed treatment, see John Miller, Jr., CARTWHEEL: The Reduction of Rabaul, a forthcoming volume in this series; for MacArthur's earlier plans see Milner, Victory in Papua. 15. GHQ SWPA, Estimate of Situation and Rough Draft, RENO Plan, 25 Feb 43, OCMH. 16. GHQSWPA, ELKTON Plan for the Seizure and Occupation of the New Britain-New Ireland-New Guinea Area, 28 Feb 43; Notes on Pacific Conf Held in March 1943, DRB AGO; JCS 238/5/D, 28 Mar 43, Directive: Plan for Opns for Seizure of the Solomon Islands-New Guinea-New Britain-New Ireland Area. In the end, Rabaul was never assaulted, but was neutralized by air action. For a fuller discussion of these and related points see Miller, CARTWHEEL. 17. Records of the conference are in the volume, TRIDENT Conference, May 1943, Papers and Minutes of Meetings (edited and printed by CCS, 1943), copy in G-3 files. 18. The subordinate committees included the Joint War Plans Committee (JWPC), the Joint Strategic Survey Committee (JSSC), and the Joint Staff Planners (JPS). 19. JSSC 40/2, 3 Apr 43; JPS 67/4, 28 Apr 43; JCS 287, 7 May 43; JCS 287/1, 8 May 43; CCS 220, 14 May 43. All bear the title "Strategic Plan for the Defeat of Japan" or something very similar. 20. The Marianas were not mentioned as a possible base for B-29's, whose capabilities had been briefly discussed at Casablanca. 21. Italics are the authors'. 22. Min, 90th mtg CCS, 20 May 43. 23. Min, 92d mtg CCS, 21 May 43. 24. CCS 239/1, 23 May 43, title: Opns in the Pacific and Far East in 1943-44. 25. In May 1943, while the Washington conference was under way, naval forces from Nimitz' command and the 7th Infantry Division from the Western Defense Command recaptured Attu. The Japanese evacuated Kiska shortly before the landing of a joint U.S.-Canadian force there in August. The Aleutians were thus free of Japanese. 26. CCS 242/6, 25 May 43, title: Draft of Agreed Resolutions. See also CCS 232/1, 18 May 43, title: Agreed Essentials on the Conduct of the War. 27. CCS 244/1, 25 May 1943, title: Implementation of Assumed Basic Undertakings and Specific Operations for the Conduct of the War in 1943-1944.